Having used Kaweco’s AL Sport stonewashed fountain pen since 2014 I thought that a stonewashed pencil might look rather nice, too. 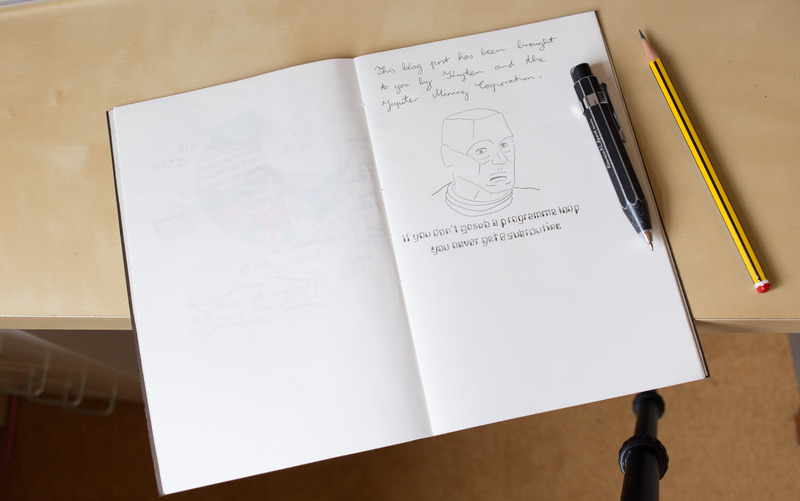 Unfortunately, the ‘Stonewashed series’ only includes a fountain pen, a ballpen (that the official name) and a rollerball – no mechanical pencil (or push pencil, the name used by Kaweco). The ballpen and the push pencil look very similar, so I thought it might be possible to simply use the AL Sport pencil mechanism in the ballpen body, but that would mean having to buy the ballpen even though I wouldn’t use it – and it’s just guesswork that the parts would fit, so earlier this year, in February, I contacted Michael Gutberlet from Kaweco asking whether there is or will be a AL Sport stonewashed pencil. I had his contact details from an earlier email exchange in 2013, when Michael Marzani from Just Another Pen and I were discussing the brass body of the Kaweco Liliput he reviewed in his blog. 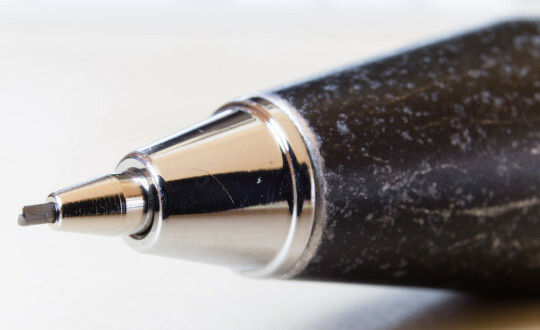 As part of the discussion Michael Marzani contacted Michael Gurberlet, who was providing information about the brass he used for this pen. To my surprise Michael Gutberlet then made a Prototype1 for me. I got the impression that the main issue when creating this pen was the push button, but since I don’t have an AL Sport ballpen I can’t really comment how much the ballpen and the pencil’s push button differ. I assume the top looks the same, but the button is different, probably because the pencil push button is held by the lead pipe, but the ballpen push button is on the click mechanism – but this is pure speculation. Michael Gutberlet seems to be very hands-on with the pens he creates, so as far as I know he made this prototype himself. 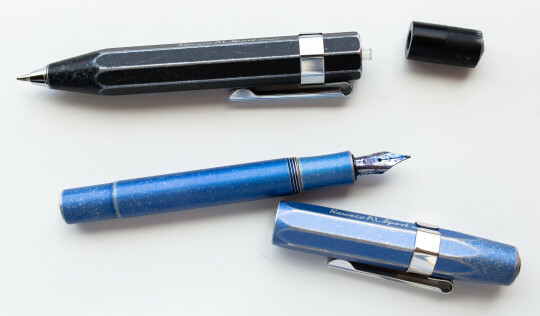 He also finishes each Lilliput Fireblue fountain pen individually. Massdrop is currently selling them for $139. In March 2016, when the pencil was ready, I was contacted by Sabine Götz – and she called it a prototype – how exciting! The word prototype hadn’t been mentioned before, so that was a very exciting moment. I guess this makes this pencil a one of a kind. I also got a bill. The pencil was a bit more expensive than the AL Sport stonewashed fountain pen I bought a few years ago, but that was more down to the fact that I found a shop that sold it for a good price. I guess what I paid for the pencil is similar to what the official retail price for an AL Sport stonewashed pencil would be. The pencil itself is quite stubby, but all Kaweco Sport push pencils are, so I knew what I was getting. Nevertheless, I think the stubbiness makes the pencil less elegant than the fountain pen version. The pencil takes 0.7 mm leads. According to the mini manual that came with the pen there seem to be versions of the Sport pencil in 0.5 mm, 0.7 mm, 0.9 mm and 2 mm, but I don’t think I ever saw the Sport in 0.5 mm. I ordered a clip for the pencil so that I can transport it easily. Pen Heaven had the best price I could find in the UK, £1.99 (~$2.90; €2.50), including postage. I do use the pen with the clip, but that does make rotating the pen (and using the lead up from all sides) more difficult. The pen itself feels solid and feels like it’s mainly made from metals (mainly aluminium) or metal alloys (the mechanism? 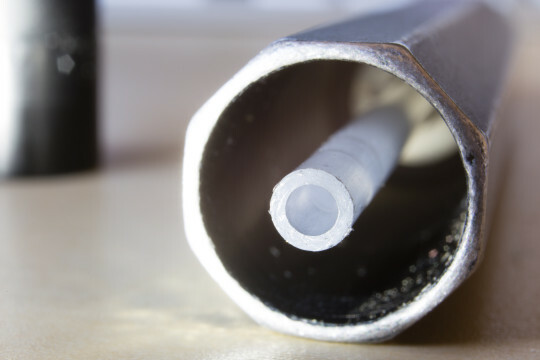 ), but the lead pipe is made of clear, slightly flexible plastic. The push button gets stuck on this pipe (friction fit). There is no eraser in this pencil. According to the manual you can store two leads in the pipe. You might think that, as with mechanical pencils from many decades ago, you can store leads in the space between the pipe and the body, but you would only be able to store leads with a length of about 2 cm there, so this space is more or less ‘wasted’. By the way, my wife was very impressed by the lead the pencil came with. Her comments were: ‘creamy and buttery, soft, but does not smudge’. That is high praise coming from her as she doesn’t like leads that smudge …so the Lamy Scribble’s original leads had to go. Her dislike for smudgy leads goes so far that she is using H leads in a pencil that is used for an Atoma notebook (H is actually great with Atoma’s paper). 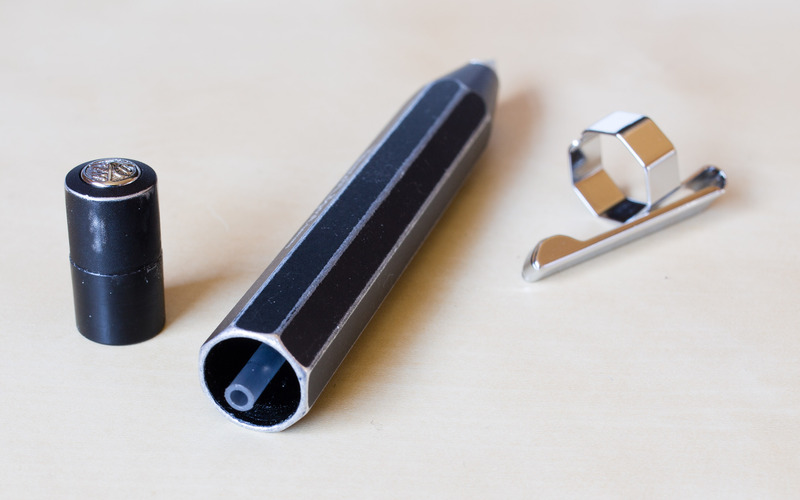 It is hexagonal and has a diameter of 13 mm (just over half an inch) – much wider than most mechanical and wood cased pencil. For comparison: the current Noris has a diameter of 6.8 mm. The pens length is 10.8 cm and it has a weight of 29 g (just over one ounce). I have used this pencil for a while now, together with the AL Sport stonewashed fountain pen. Together they are such a nice pair. I have to say that I always preferred using the pencil, despite its stubiness. 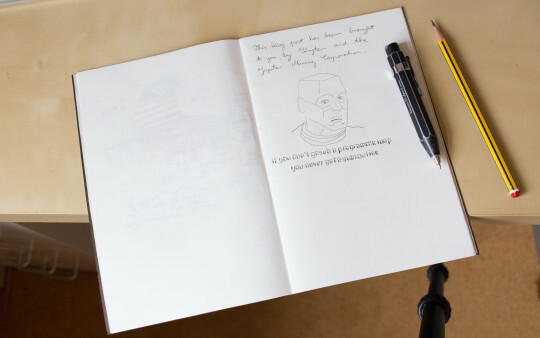 I find the pencil’s look much less attractive than the stonewashed fountain pen’s elegance, but because it is instantly ready it was my pen of choice – there is no cap that needs to be taken off and posted first. Overall this is a great pencil, even though I would prefer a slimmer, longer version. I wonder whether this stonewashed pencil (not my imaginary slimmer, longer version) will be available in shops in the future. I guess the original problem was that different pen parts need ‘stonewashing’ for different lengths of time, but now that there is a prototype (and a recipe how long its parts need ‘stonewashing’) it should be easier to make more stonewashed pencils. Regarding the stonewashing: I have to add that my fountain pen has a better stonewashed effect, but this might be caused by the different shape of the parts (or, less likely, the different paint). The question now is whether Kaweco sells enough pencils to think it’s worth offering an AL Sport stonewashed pencil. I would like to thank Michael Gutberlet for making this prototype for me. Dries has a review of the RAW version of this pencil. It looks great, although the chunky body suggests “lead holder” rather than mechanical pencil to me. 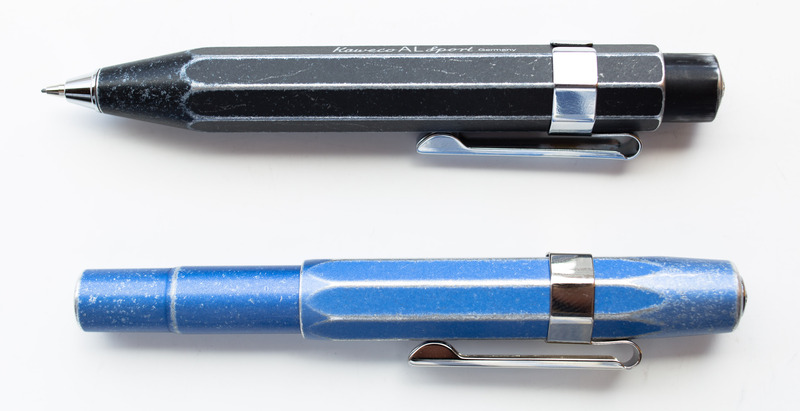 I think Kaweco’s original twist pencils form the 1930s, which had a similar look, used 1.18mm leads. I guess that’s where the look is from, but I wonder whether the modern version is even more chunky than the original. I’m happy you recognised Kryten, I wouldn’t call it nice, though. Well, it was all in a rush, that’s why the lines are squiggly and the eyes look in different directions. This was my second attempt at drawing him. The first attempt was a few months earlier when I had the idea for this and drew it in my “Bleistift Field Notes”. That first Kryten looked much worse. Pingback: Just another pen ? !Blick über den Tellerrand vom 7. 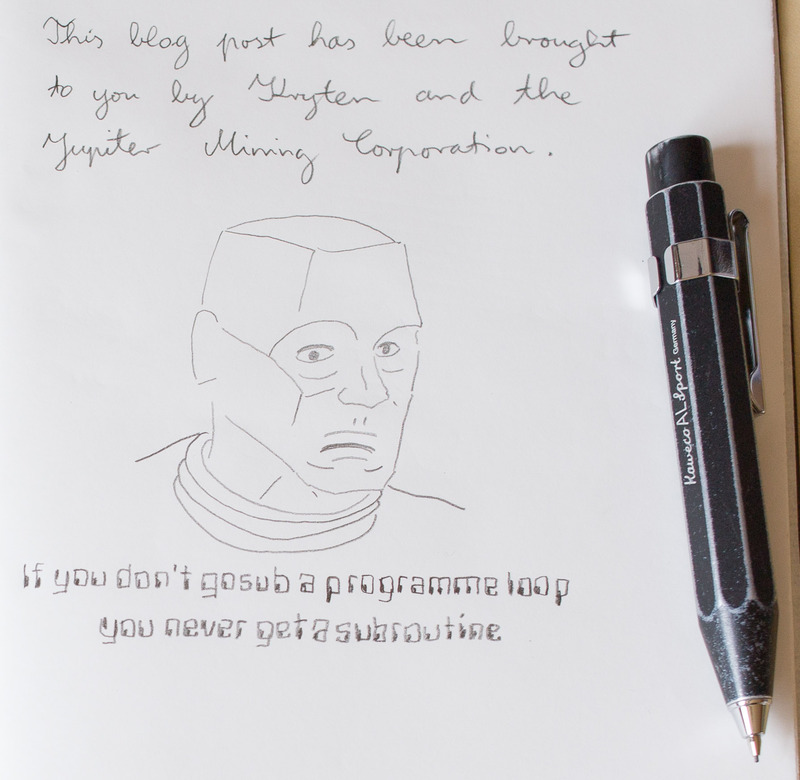 May 2016 - Just another pen ?! today was the fair in Nuernberg an I bought the new Supra from Michael with the new brass without lead. And this is awesome! It is not so yellow then the usual brass but for me I looks even better and I hope the patina is not so strong then on the old version. Michael, thanks for your comment and greetings to my Bavarian home Bavaria (I couldn’t resist the Fredl Fesl reference). Wow, no-lead brass! Do you know whether it the the brass from the manufacturer we were talking about back then? I don’t have a brass pen, so I wonder how the patina on your pen looked like after a while..
Do you have any idea if this prototype got ever produced? Been looking for it everywhere, but have failed miserably finding it.